Herm Sprenger Stainless Steel Check Chain Dog Collars are a dog training tool only. Although often mislabeled as ‘chock chain’ and used incorrectly. 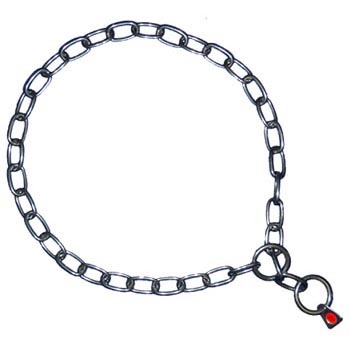 Moreover, when used correctly check chains are a suitable type of dog collar for dog trainers and everyday dog owners. Furthermore, Herm Sprenger check chains are available in a variety of finishes, styles, and lengths. As with any lead, collar and harness tool you choose to use with your dog. We highly recommend seeking assistance and help from your local dog trainer. Or speak to our helpful dog trainers at West Coast Pet Care. Stainless Steel (solid) chains, are more expensive than our normal steel range. Moreover, our stainless steel chains are better suited to dogs that live in coastal areas or spend a lot of time in the water. Normal steel will become dull, and, especially with time spent in saltwater, will roughen the plating and become rusty. Thus, Stainless Steel also has a higher breaking load producing greater security and also a longer life. Furthermore, all Herm Sprenger Stainless Steel chains are marked with a metal label and a shiny red point with HS-GERMANY in the middle. Plus a with “HS-GERMANY INOX” stamped on the rings. Stainless Steel Check Chain Dog Collars are available in two styles. Standard Round Links are the most popular type of link style used. Often used by not only trainers and professional dog handles but also by the everyday dog owner. Furthermore, the 2mm and 2.5mm check, not “chock”, chains are the one of our average and most popular sizes available. Suitable for small to medium dog breeds these chains are often used for dog training and by the everyday dog owner. – We recommend that you measure your dog’s neck circumference reasonably high. Just behind the ears, then add 5cm for small dogs up to 10cm for large dogs. – For dogs with a particularly large head relative to their neck size, you may need to measure the circumference of the dogs head rather than the neck. before using this training tool with your dog.